I like the picture of your mom, she looks cute :o) ….will you have a dust bunny bbq tonight? Say – what a great idea – a dust bunny BBQ – heaven knows that would be an ALL YOU CAN EAT BUFFET if we did it! HAHAHAHA My Mom was a fake blonde back then but your Mom is a REAL one! Aren’t they hilarious? Imagine trying to put those on a cat….HAHAHAHAHAHA! I LOVE your human’s photo! She totally looks smart and cute. I’m not surprised she grew up to be so creative. Awww….what a sweet thing to say – you just might have made my Mom’s day! Gah! Your young mom is super cute! She hasn’t changed a bit…..
HAHAHA…..well, quite a few AREAS of Mom have changed but hey – she’s still my Mom and I love her just the way she is!!!!!! Oh, Sammy, we LOVE that pic of your Mom. And we really don’t think she’s changed much at all! And, yep, that’s what it looks like under our sofa, too. Sammy your mom was very pretty when she was young but she is a true beauty now outside and inside. Give her a big hug from us. I want to try those shoe things on my little sisfur. She races around the house all the time. It would be clean in no time with those. UHOH……vacuum monster is coming out THERE too? Oh no!!!! HIDE CODY HIDE!!!!! I felt somewhat faint when Mom showed me those too…………..I hope she didn’t get any ideas! Love the picture of your Mom!!! Just concentrate on bacon today Sammy while the super sucker vakoom is out! Aw thanks….Mom says she can’t believe she was EVER that young. HAHAHA I’m thinking about tomorrow’s bacon-o-rama and it helped get me through the housecleaning this morning. Thankfully it’s nice and QUIET here now! Our boy Bacon is gonna be so happy to be home, he’ll probably run around the house like a mad man! WATCH OUT HOU HOU! I bet I know WHOSE teeth marks! I hope the cleaning is done and life is back to normal for you, Sammy! Lots of small things find their way under or sofa. When the bipeds run out of pens they pull the sofa out. Mulberry takes any pens he finds and he stores them under the sofa. I think your Mom looks beautiful. Hope she vacuums quickly. She did – she and Dad did the whole thing and now the rest of the day will be QUIET! Thanks for the compliments on my Mom……she said “everyone looks beautiful when they’re 21” – HAHAHAHAHAHAHA…….anyway, she feels like that was a lifetime ago. SAMMY WE ALWAYS LOVE YOUR FRIDAY MONSTER POST. dood…we iz crackin up at fotoz three…that kitteh just had like Christmas in whatever month they mewed de sofa !!! I wonder why someone can’t make a silent vacuum Sammy! Your Mom looks was cool!!! I don’t know why there’s no such thing as a silent vacuum either! They make mufflers for cars – why not for vacuums???!!!! You have consistency in your home which is what cats love. And your mom is adorable! Oh we do have consistency – my Dad is like a military commander – we’re on a schedule and that’s that! Well not QUITE that bad but my Dad likes things to be “as planned” and Friday is CLEANING DAY PERIOD. I’m glad you like Mom’s old photo. She can’t believe she was EVER that young! Well, Mom WAS super cute back in those days – 1968 was a LONG time ago (tee hee)……but thanks!!! Aren’t those dust mop boots HILARIOUS? Hmm……I hadn’t thought of those in the snow……they would keep my feeties warm wouldn’t they! Wow, Sammy you have a very purrdy mom. 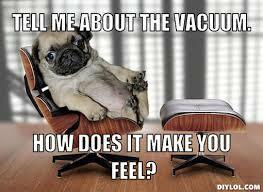 I hope the vacuum monster doesn’t bother you too much. I like to find a good hiding place when the monster comes out, then when my mom finds me I find another hiding place. Well now remember that photo was taken in 1968………she was only 21………everybody is pretty at 21. HAHAHAHAHAHA I stayed out of the way today when the cleaning started – DOWN IN THE BASEMENT where it’s cool and quiet! What a fun picture of your mom! She looks beautiful! And it seems that the Feline Swiffer has some stiff competition 😉 I hope you survive cleaning day – I feel your pain, Sammy!! Hi Carol! 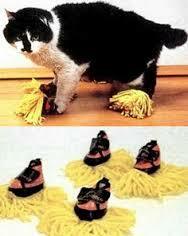 Don’t you just love those dusting booties? I tell ya, if Mom gets some of those for me, I’m outta here! HA! Movie star from the silent film days maybe…..hahahahaha…………I agree about cleaning house vs. visiting blogs – gimme a blog any old day! Geez! It’s a wonder we’re still alive after these monster attacks, Sammy. Somehow we manage to stagger out of the way of these nasty and noisy fellows each week. I love the picture of your mom in 1968. She looks like such an innocent young lady. Hi Shoko! 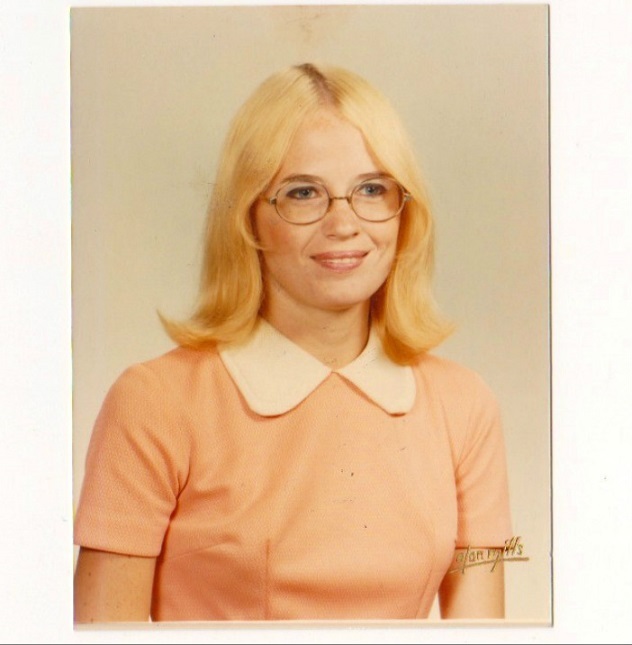 Mom was pretty darn innocent – she’d been married for a year when that photo was taken – but she looked pretty much like that when she graduated high school only maybe not QUITE as blonde! In Florida where she was living in 1968 EVERYONE had blonde hair. 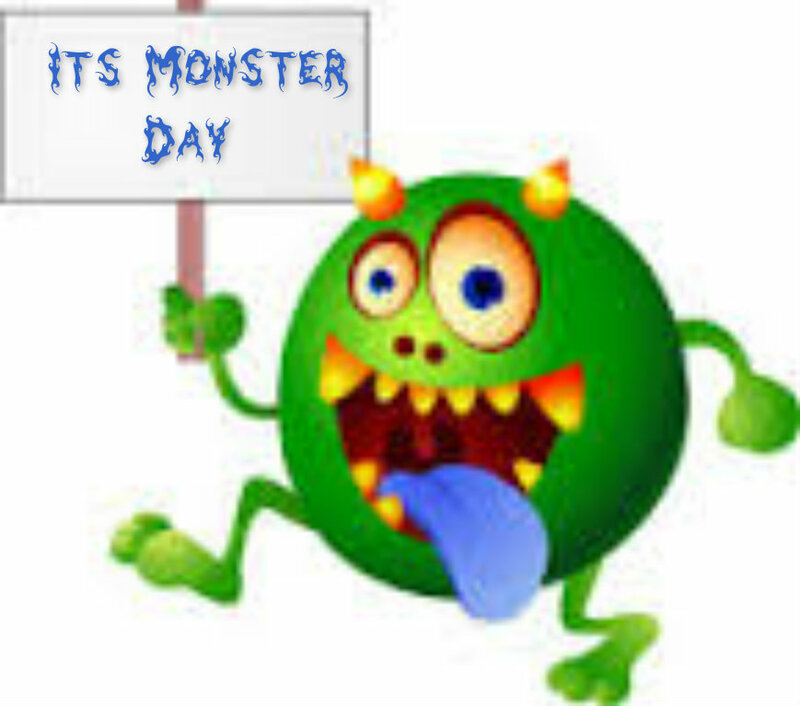 HAHAHAHA I hope you avoided any monster attacks you may have had this week – I’m a “SURVIVOR”! Oh I bet they did………My Mom’s hair is naturally mousy brown and she doesn’t have much gray but she LOVES gray hair so she hopes to get some one of these days. Her Mom’s hair was silver when she was my Mom’s age……STILL WAITING! Oh for heaven’s sake! Mom’s mother was snow white by the time she turned 30. Isn’t that odd. Yes! My Dad’s Mom had white hair and my Dad had his in high school!!! Funny how that goes………..
Aaaaaw Sammy yous mommy was bootyful back then too. Don’t know why dat wuld be barrasin’. Have fun hidin’ fwum da cawpet monster. Mom says thanks for the compliment….I think it embarrasses her that she has come such a long way in the aging process since 1968 but then again OF COURSE SHE HAS since that was a long time ago! Time flies but the important thing is she’s happy – right? Yeah Sammy mommy dusn’t like to age eever. She sez she fights it wiff all she has. But she agwees, bein’ happy be da mostest purrtant fing. 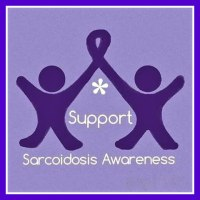 My Mom says she watched her own Mom really fight the aging thing and vowed then not to be so worried about getting older when HER time came! However she looks in the mirror and sees wrinkles and sags and gray hair and gets just a little sad about “the old days” !! That is a lovely picture of your mum Sammy. My mum had better not even think about those dust mop boots! Same here on those boots Flynn….imagine the indignity of trying to walk across the floor in those things? I think our Moms are both sensible enough to know that definitely is a “NO GO” for both of us! There’s no escaping the monsta, Sammy! Hi Siddhartha! I can still see “Mom” in that old photo but just barely…..HAHAHA…..kinda fun to see old photos isn’t it? 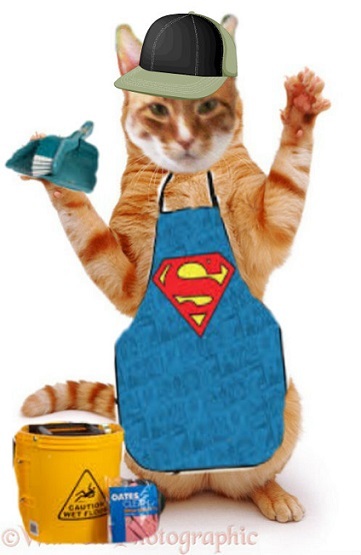 I survived housecleaning just fine and this morning had my bacon so my world is PURRRFECT right now! I hope yours is too little one! 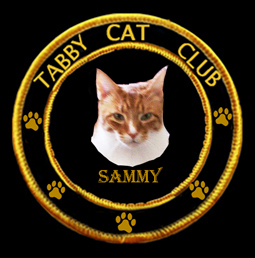 Mew mew mew Unccle Sammy yur Mumma iss so purrty an has a luvley smile! Mee has been a pawfull again so LadyMum iss NOT smilin again…. Mee tried to run away again…. LadyMum said shee iss takin a brake frum blogging an mee finks shee iss seereuss. Mee reelly uppyset her again…she did say even takin a brake wee will keep inn touch…mee begged her not to stop blogging entirelee…. 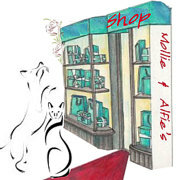 So wee are werkin on a bloggie fur tomorrow. No bacon fur mee today…mee REELLY ISS inn thee doggie-house! I read about your antics little one and I must say, you really are a POWERHOUSE of energy……maybe there is something that will help calm you down just a bit but still allow you to be the energetic little guy that you are. You worry your Ladymum so much when you run out the door – it’s not a good thing to make her worry. I once disappeared in the back yard when Mom and I were outside together and she cried and cried because she couldn’t catch me – I was too fast for her – so she just waited in the yard for me to get tired of being on my own – which I did – an hour later I came back and was SOOOOOOOOOOOOOOO happy to see her and I never did that ever again. Well it has taken thee edge off mee hollerin at LadyMum an helpin mee to foe-cuss more on LadyMum when shee speekss to mee. Wow you ran off Unccle?? Mee can just see Lady Pam sittin waitin fur you cryin up a storm! See you leerned frum one time to bee good. Even with thee Bach’ss inn mee, mee ran out thee apartment an tried to get uppystairss to 2nd floor! LadyMum was furry angree when shee cott mee. Oh dear boy I can remember being your age and we really do have so much energy to burn! 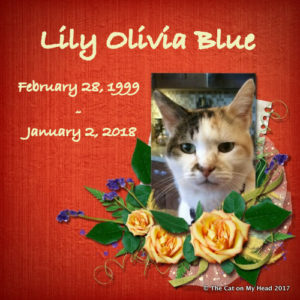 My Mom often said if I’d had a “kitty friend” to grow up with I might have been more calm but then again I was the only little kitten at the shelter when she adopted me! Imagine having someone to chase and wrestle with though……Being an only kitty isn’t all that great sometimes! HAHAHA Anyway, I hope the Bach’s helps keep you cool, calm, and INSIDE the house so you don’t scare your Ladymum. 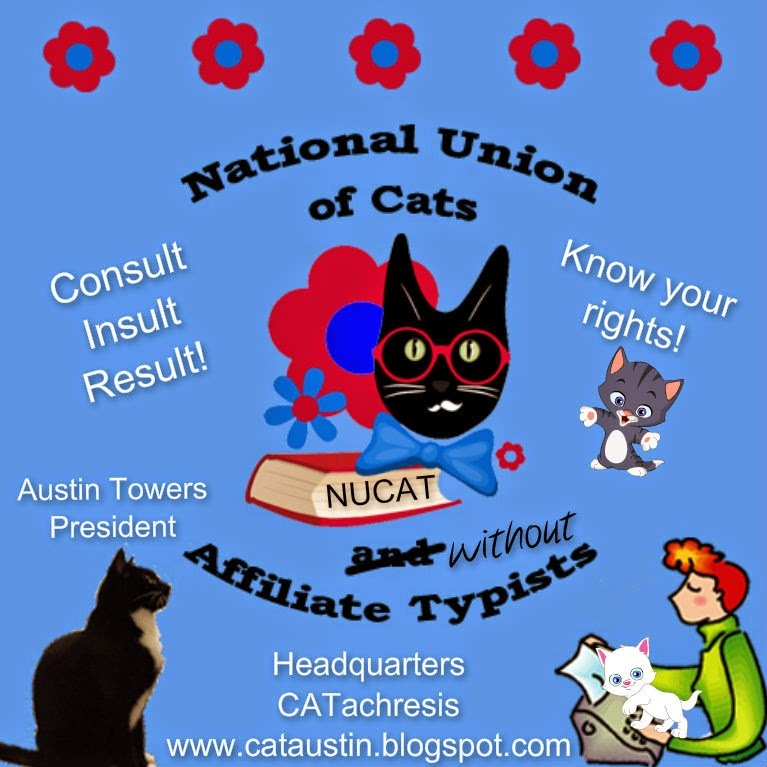 They love us so – and we don’t want to worry them! Oh yes – the refrigerator is a good one too. When Mom and Dad got a new refrigerator a year or two ago there were about 10 wads of paper and foil (which was my favorite toy as a baby) under there! HAHAHAHAHA Glad you liked my Mom’s old photo – I think the 60s and 70s the style was longish hair and if glasses were needed – BIG frames. Mom sees those now and giggles although she’s still wearing glasses they don’t look like that any more!!!!! Forget the dust bunnies-you gotta watch out for the dust parrots. HAHAHAHA…..gosh – I didn’t know there were dust parrots – should I be scared??? 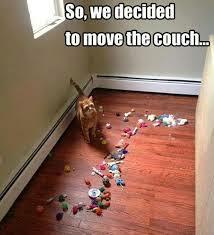 The couch (and some chairs) are our “bottomless pits” when it comes to where do all the toys disappear to. HAHAHA And socks, pens, and anything else we can steal too! 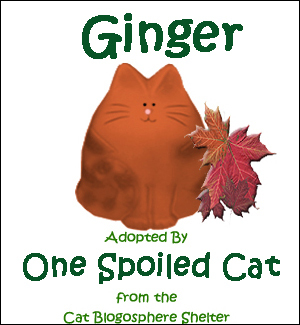 Awwwww, Sammy, your mom’s pic could have been the perfect Tuesday Teaser – all greenies would have been remained on your polydactyl paws! 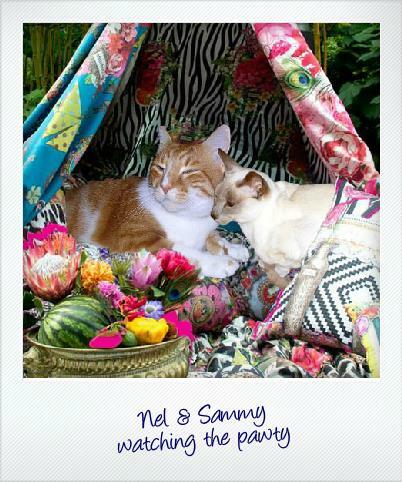 Yure so wise Unccle Sammy…when mee was with mee Brofur Tyerrone mee was so well behaved! That iss why LadyMum thott ’bout takin mee back to thee farm so mee oculd bee with mee Brofur an thee furamillee. LadyMum adores mee tho an iff mee left her shee wood bee heart broked…(shee told mee).. So mee has to leern how to bee a good boy an play with LadyMum….she iss allwayss tryin to get mee to play! So far today mee not had any Bach’ss an mee onlee freeked out fur 10 minutess an then mee calmed down on mee own!!! LadyMum praised mee ALOT!!! You’re just a youngster and you will be calming down more and more as you get older but because you know your Ladymum gets sad when you’re bad, I think you’ll stop that on your own!!!! !